There’s this little independent bookstore café in New Haven, right in the heart of the city’s shopping area as well as Yale University’s art district and on the fringe of the iconic dormitory colleges which still make me feel like I’m walking around Hogwarts rather than a New England small city. Atticus is the name of this place and I’ll admit that I don’t go there for the books. I go for the black bean soup. And the bread but that’s another story for another time. For years I’ve been planning to replicating this smoky black bean soup at home and after a few close attempts, I finally nailed it. The key, which I remembered upon a recent bowl at lunch, was that the soup Atticus serves is not vegetarian; it’s made with a base of sauteéd bacon. Let me tell you, the bacon makes aaaall the difference here! That smoky bacon boosts the flavor of the cumin and is the key to bring the soup together. 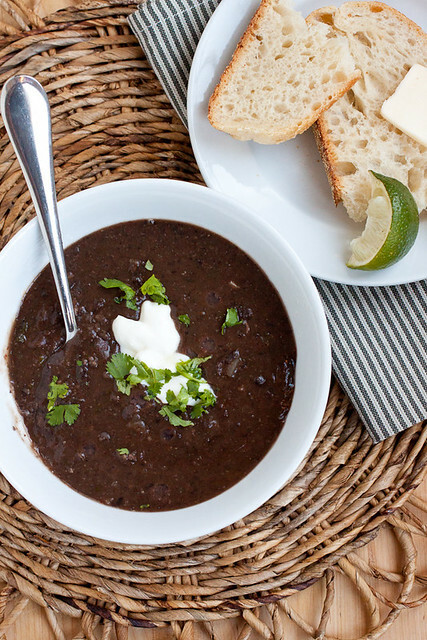 This smoky black bean soup recipe is a very basic one and now that I’ve got it down pat, I can start obsessing about replicating Atticus’ ciabatta rolls. Sauté the bacon for 5-8 minutes. Add the onions, a few cranks of freshly ground black pepper, garlic, cumin, and chile powder. Stir in one cup of the broth and scrape up the bits from the bottom of the pan. Stir in the rest of the broth and the water. Bring the mixture to a simmer and add the beans. Simmer for 20 minutes. Pureé the soup with an immersion blender until most of the beans have been pureed (or transfer most of the soup to a blender to pureé). Stir in the cilantro and continue to simmer until the soup has thickened, another 5-10 minutes. If the soup foams, skim off the foam with a shallow spoon and discard the foam – this is normal for black bean soup. Stir in a couple squeezes of lime before serving. I love black bean soup! This recipe sounds great! I wonder hoe well this would freeze. Sounds delish! I think it would freeze fine. You’ll probably need to add a little water or broth to thin it out when reheating but that’s it. Enjoy! Yup – how could anything be bad with a bacon base?? Hi Carol! I hope you love it! Please come back and let me know!